It is a rare skill to make people laugh and gasp with amusement when speaking about post conflict transition. 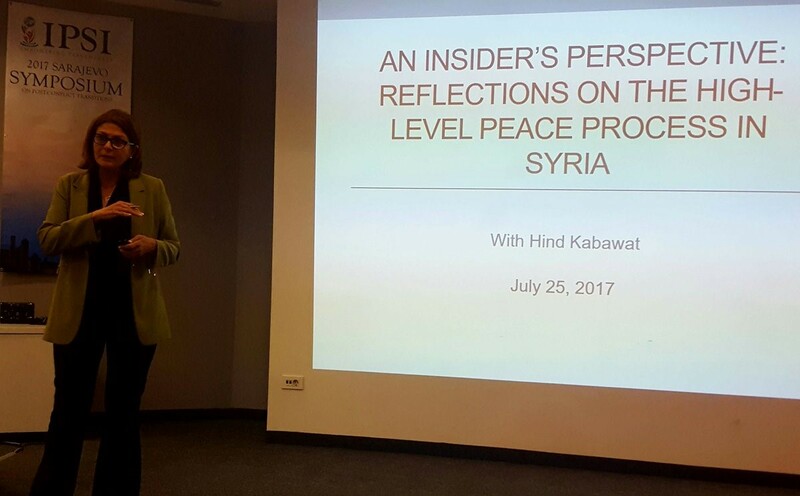 Hind Kabawat, founder of the Syria Center for Dialogue, Peace and Reconciliation and current member of the High Negotiations Committee (HNC) at the Syrian peace talks in Geneva did just that. 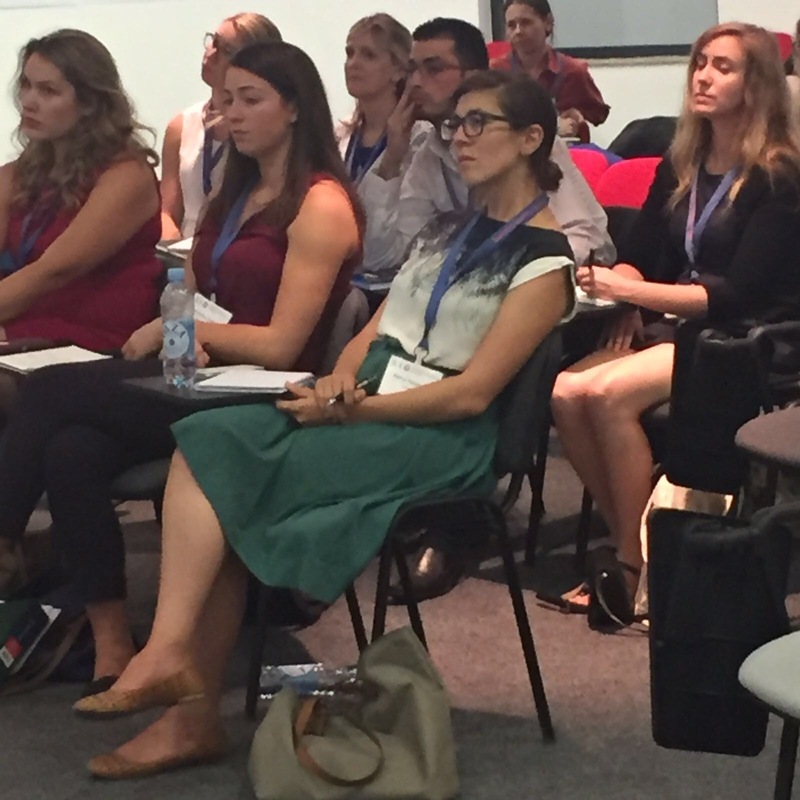 This week, the IPSI Sarajevo Symposium was fortunate to host Ms. Kabawat for both a lecture and simulation on the current conflict in Syria. Her presence served as an important reminder of the value of vulnerability and humor in peace negotiations. Since the beginning of the Syrian revolution, Ms. Kabawat has piloted numerous training programs related to conflict resolution, women’s empowerment, and negotiation skills in Aleppo, the Atmeh IDP camp, Istanbul, and Amman. She has trained hundreds of Syrians in multi-faith collaboration and civil society development. She brought this knowledge to the IPSI Sarajevo Symposium to expand participants views on models of post-conflict transition. Ms. Kabawat’s lecture was intimate, honest, and human. I say human because of Ms. Kabawat’s ability to be vulnerable with complete strangers. She shared how difficult it has been to fight on the behalf of Syrians, particularly Syrian woman via her role on the HNC’s Women’s Advisory Committee, sharing, “I often go home and watch Turkish soap operas just to give my mind and heart a rest.” She went on to say there have been many tearful moments post negotiations but that hope remains. Ms. Kabawat was the first speaker at the IPSI Sarajevo Symposium to speak this candidly about the emotional toil of peacebuilding; especially for those that choose to work in their countries of origin. For those willing to face some difficult emotions by working in their country of origin there are advantages. Understanding local humor and having a willingness to softly elbow and nudge decision makers creates space for small change. Ms. Kabawat shared numerous examples of informal meetings with opposing sides where humor made a significant difference. She joked that everyone in Damascus knows everyone and that she continues to use school age friendships and distant cousins as door opening tools needed for a peace agreement. Ms. Kabawat left a message of hope for IPSI’s Sarajevo Symposium. She is a realist and knows that the best place to make change is within the HNC by fighting for a better agreement for the Syrian people. In a reflective moment, she noted that she knows the United States, Russia and Turkey are key for peace in Syria and that she cannot influence them. Instead, she is focusing her energy on including Syrian women in the peace-making process.